Tomorrow (Saturday October 5) are the first two event finals of the World Championships. You can watch live in the US here starting at 8:30am EST. The plot twist will be an possible half twist. Hong Un Jong has submitted a Triple Twisting Yurchenko to be named after her. If she is able to add a half twist to her amanar and stay on her feet, she will undoubtedly win. We have yet to see her do the vault, but anything can happen in a World Championship Final! Check out each of their qualification vaults! McKayla has gone through so much in the past year, it truly is quite amazing that she is not only at Worlds, but has improved since last year. Three surgeries, media frenzy, meme fame and a changed life. She has made no bones that she has some unfinished business called doing her best at the Olympic vault finals. So between now and then, she will give gymnastics her all. Though vaulting is what she shines at, she really wants to be an all-arounder. And floor is her favorite event. So it was incredibly meaningful for her to be able to compete all around in the qualifications. She didn’t have her most spectacular day, but she did really well. She started her day out on floor. She had a number of small bobbles on her landings and her leaps weren’t quite all the way split. But it was really a great routine. Many on the gymternet felt like she was really underscored here. After seeing her INCREDIBLE vault in podium training, this amanar was anticlimactic. 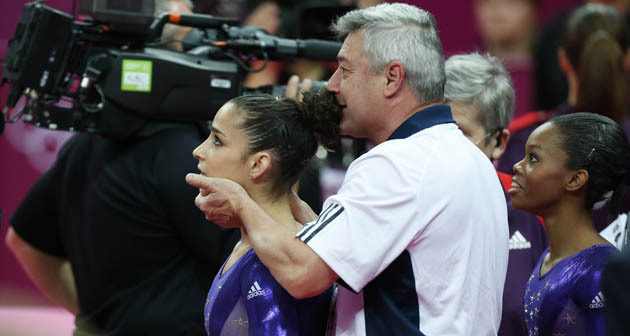 But it was a normal, amazing vault from McKayla. Her second vault however, was one of her better ones. McKayla is not known for her bars. But this was most definitely one of the best bar routines she has ever done! On the other hand, this beam routine was most definitely not her best. Getting into the swing of competing beam again often takes some time. As always, the highlight of the day was McKayla’s interview. Such poise, so much authenticity, and so much grace. i fall more in love with this girl every interview. She only qualified into the vault finals, being another victim of the 2 per country rule on both floor (where she tied with Kyla Ross but the tie was broken with Kyla’s higher E score) and the all around (where she placed 5th in the world). 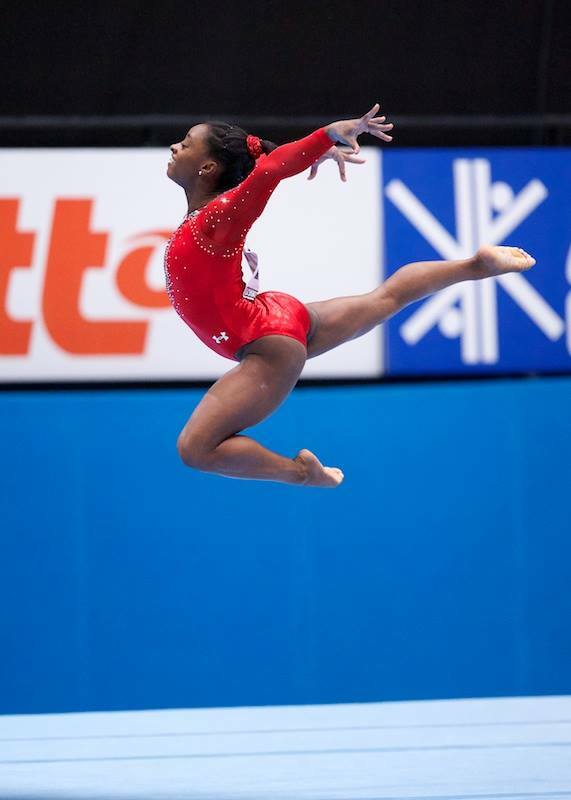 Simone Biles is USA’s Queen of Springs. I really think there are springs in her legs! The way she tumbles is just amazing. She is doing some of the hardest floor passes in the world and yet it seems like she is just getting started. She does these high flying skills that should take everything she’s got and instead she has power to spare. And she punches off the beam like she is tumbling on the floor. Simone has such a sweet personality, and the joy of gymnastics just shines through everything she does. I used to coach a gymnast who would be barrelling down the vault runway and just break into a huge grin. Every single time. She just loved it so much. Simone does that as well. You can tell her smiles on floor are as more from her love of doing what she is doing than putting on a performance. Simone had an incredible day of qualifications. She just hit everywhere! She started out on bars, where she earned a higher execution score than even Aliya Mustafina! Simones presentation and poise on beam has improved so very much this year. She really hit her skills with precision and attacked the beam. Simone completely rocked floor. Her tumbling passes were sky high and mostly stuck. She performed her little hear out and was a joy to watch on floor. Simone gave McKayla a run for her money on vault! She put up two awesome vaults. Simone is going into the All Around finals as the leader of the pack. She also qualified for every event finals. She is the first American to do that since Shannon Miller! Kyla Ross has gone from the Queen of Clean to the Empress of Elegance. Last year, I was always so impressed with her beautiful lines and lightness of movement. But her gymnastics didn’t keep my attention. It didn’t inspire me. No longer. Kyla now commands my attention on every event. The change is not only in her incredibly improved expression, artistry and dance on floor and beam. Her experience in Olympic competition, the media frenzy, fame and the incredible bond of her team has given her a poise, a presence, a confidence that shows in everything she does. From her interviews to her height, her bright red lipstick to her beautiful routines, Kyla has grown up. Kyla stepped out onto the floor today in a beautiful red leo with red lipstick to match. She looked gorgeous. And fierce! She was raring to go, always the first one off from the line-up to prepare for the event. She did a beautiful DTY, but not the best she can do. She had a much bigger hop on her landing than normal, but it is still quite a gorgeous vault. Kyla’s has such a light and airy swing and competes bars with a calmness that is almost peaceful to watch. She is a little short on a few of her handstands, but other than that, it was a great routine. Stuck landing and all. Kyla competes beam like she is dancing in the clouds. Every movement is done with a lightness and a preciseness that just makes it look like she is floating. This was a great routine. She missed one of her connections and had the tiniest of wobbles. But this is a routine I will watch a few times. I really am falling in love with this floor routine. The choreography is beautiful, playing with little nuances and hits in the music and really expressing the music well. And Kyla is performing it so well. She has great musicality, expressiveness and of course, execution. This is undoubtedly the best floor routine she has ever done. And a stick on her last pass to boot! And perhaps where she has grown the most is her ability to interview. She is delightful, humble, authentic and just fun to hear from. What a great start from our Empress of Elegance! Earlier this year, I wrote that it was great to have stars like Gabby Douglas and Jordyn Wieber on your team, but that you also needed a rock. Aly Raisman has been that rock for team USA since her senior debut in 2010. She has gone out routine after routine, meet after meet, year after year and hit her routines. Over those years, she has always been in her teammates’ shadows. In the 2010 World Championships, she qualified into the All-Around Finals in third, just behind the current USA “It Girl”, Rebecca Bross. A disasterous mistake on bars, her nemesis, left her 13th. In the 2011 World Championships, she qualified into the All-Around Finals in fourth, also behind the current USA “It Girl”, this time Jordyn Wieber. Another mistake on bars left her fourth. This year, Aly came in with upgrades on every event, and has even improved on bars. But her lower difficulty on bars usually left her about a point behind Gabby Douglas and Jordyn Wieber. She continued to be the rock, they continued to be the stars. I often mused with friends about how Aly could legitimately challenge for the All-Around podium if it wasn’t for that awful two per country rule. I lamented the fact that after all her consistency and team leadership, she wouldn’t even get to compete in the All-Around Finals. After all, it was inconceivable that Jordyn wouldn’t qualify, and Gabby has looked stronger than ever in training. But the inconceivable became reality today as Aly was the highest US All-Around qualifier over BOTH Gabby and Jordyn. With the two per country rule, this means that Jordyn Wieber, the reigning Word Champion will not get to compete in the All-Around Finals. In my All-Around Hopefuls post I wrote: Aly would need someone else to make a mistake to make it into the finals and onto the podium. But her rock solid, consistent performances make her a gymnast you should not count out. After all, anything can happen in the pressure of the Olympic spotlight. There was no one more surprised than Aly herself in qualifying in first. Over the years she has captured our heart with her humble attitude, sky high tumbling, sweet smile and loyal friendships with the other gymnasts. She continued to do so today, with a response of concern for her teammate and best friend Jordyn Wieber. Today Aly becomes a star herself. The last two years, the only routines she ever missed on a world stage were bars in All-Around competition. If she can go out in All-Around Finals and be the rock for herself that she always is for her team, she will no longer be Aly the Rock. She will be Aly the Rock Star.